Products are NOT approved for medical use (unless otherwise stated); not intended to diagnose or treat any disease.Do NOT assume that products are associated with information appearing on this page. See full Disclaimer. This is as close as it gets to a true "University of Ozone"
Credentialed Teachers with Clinical Experience and 4 Ozone Therapy Training Courses to Offer You! Oxygen Healing Therapies is pleased to advertise the most comprehensive Ozone Therapy Training Courses in the world. We focus on listing Ozone Therapy Training Courses that will enable you, the attendee, to obtain a full understanding of the background Biochemical, Immunological, and Physiological effects of Ozone Therapy, while also providing internationally accepted Protocols (Methods of Administering Ozone Therapy) for the Safe and Effective use of Ozone. Central to these course listings is the integrity, experience, and knowledge of the speakers and lecturers of the courses. They are professional, articulate, extremely well educated, knowledgeable and talented in their dispensing of this most important information. If you wish to join the thousands of practitioners around the world who are using Ozone Therapy in their practice (such as those on our Ozone Doctor List), please obtain formal Ozone Therapy Training from an experienced and licensed expert. These Ozone Therapy Training Courses will allow you to do just that. Dr. Shallenberger's Ozone Therapy Training & Certifcation Course - "The Essentials of Natural Medicine"
Continental Breakfast each day; Coffee, Tea, and Snacks Served throughout each day. Why is Dr. Shallenberger's Ozone Therapy Certification Course the Leading Ozone Therapy Course in the world? Easy Answer: Because it's simply the best in the world. "This was the single best post graduate medical course I have ever taken. I am involved in teaching complementary alternative cancer therapy courses myself, and I found Dr. Shallenberger's courses to be Practical, Accurate, and clearly presented." May 30 - 31, 2019 Reno Nevada USA. SORRY BUT THIS COURSE IS SOLD OUT. June 1 - 2, 2019 Reno Nevada USA. June 3, 2019 Reno Nevada USA. Note: Only a few spots left in the Advanced Prolozone® in June 2019. Register NOW! Learn More: Once you have taken the Beginning Prolozone ® you will want to Advance your knowledge by taking this course. Buy Dr. Shallenberger's new Book The Ozone Miracle book BEFORE you attend the class. It's only $8 Kindle and $20 print, an easy read and will prepare you for the course. You're investing time and money to take the course, get the most out of the course by self preparing first! The Ozone Miracle includes detailed protocol information on how to use ozone. This is a great way to prepare for the course...buy Dr. Shallenberger's bestselling book The Ozone Miracle!..... To Review the book and/or purchase it: Click Here. 1/ Speaker & Teacher: Before registering for a couse you need to ensure you will be learning from someone with the proper credentials and experience. For those reasons Dr. Shallenberger's Ozone Therapy Course is the highest quality, most comprehensive, and best value for the dollar Ozone Course in the World. Dr. Shallenberger has been teaching and expanding this course since the 90's. Most of the other ozone instructors teachng Ozone Therapy classes have learned Ozone Therapy from Dr. Shallenberger himself. He is the "Godfather" of Ozone. This is your opportunity to from the true original Ozone Therapy Doctor. 2/ From the Basics to Cutting Edge: Dr. Shallenberger's Ozone Course includes a background basic understanding of how ozone works, from easy to understand biochemistry, physiology, and immunology. From year to year Dr. Shallenberger also expands and refines this course to include pertinent up to date breakthroughs in modern ozone research. Here, you can learn it all. 3/ Theoretical to Practical Hands On: While a firm understanding of how ozone works is essential to the professional practitioner, so is experience and training actually using ozone. This course program includes practical hands-on supervised training in the essential application methods of, for example, Prolozone. Experienced trainers will teach and guide you so you can perform the protocols when you return to your office on Monday. 4/ A World Wide Approach: Practitioners from 14 different countries attended the February 2018 Ozone Therapy Certification Course. Practitioners travel thousands of miles to attend this world leading ozone therapy course. Dr. Frank Shallenberger's Ozone Therapy Certification Course quite often sells out with hours of the opening of registrations. This Ozone Therapy Certification Course is clearly regarded the leading ozone therapy course in the world, and with good reason. International Ozone Therapy Course; Learn at Home! A Complete and Current Ozone Therapy Certification Course for International Practitioners (Lecture and Live Demonstrations!) for those outside USA/Canada/Mexico. Important Note: This Distant Learning International Ozone Therapy Course is available to practitioners who live outside of North America only (outside of USA, Canada, and Mexico). Dr. Frank Shallenberger MD, considered one of the world's foremost expert on Ozone Therapy teaches you his Ozone Therapy Course in your own home or office! This pre-recorded and complete Ozone Therapy Training Course provides any and all Practitioners from outside North America* the opportunity to learn all about Ozone Therapy without leaving your home country! See the Introductory Special Below!!! 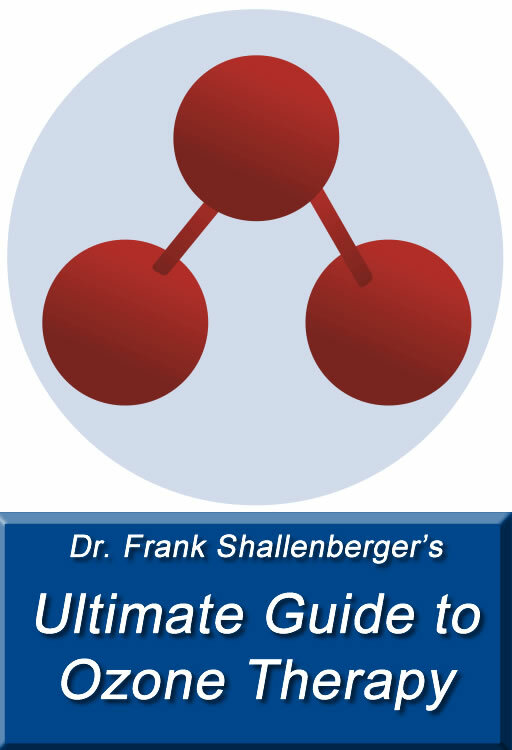 Best selling Ozone Therapy Instructional Book: A copy of Dr. Shallenberger's book, "Principles and Applications of Ozone Therapy", a $65.00 value. Ozone Academy Membership: A one year international membership paid dues in the American Academy of Ozonotherapy (aaot.us), a $300.00 value! Certificate: A "Certificate of Completion" to hang on your office wall. Extra Bonus! : A live conference call with Dr. Frank Shallenberger himself, to answer your questions about the content of the course after you have completed the course. A $300.00 Value! The full value of this course is over $1690.00 USD, available to you for this introductory offering of only $800.00. That's about 50% Off the Retail Price! But hurry, this price won't last long! *Please Note: This Distant Learning International Ozone Therapy Course is available to any and all practitioners outside of North America only (outside of USA, Canada, and Mexico). The only "True" Ozone in Dentistry Courses, offered by the world experts on Ozone In Dentistry. Full explanation as to how ozone works, why ozone works, and how to use ozone in your daily dental practice. 1/ Dental Caries - kill the bacteria in them before the carie reaches the dentin = no need for drilling. 2/ Periodontal Disease - kills all pathogens while supporting tissue health; resolves periodontal disease quickly and effectively. Dr. Robert Harris DMD and Dr. Phil Mollica DMD have been using ozone in clinical practice since 2002. Both of these experienced clinicians are Professor Emeritus from the Departments of Dentistry and Integrative Medicine at Capital University of Integrative Medicine Washington D.C. and both are on the Board of Directors of the ACIMD - American College of Integrative Medicine and Dentistry. They are the lead investigators in a national outcome study on the use of oxygen/ozone in dentistry. Their Clinical Course and Workshop on the Use of Ozone in Dentistry is restricted to only 10 students to provide each individual an outstanding 'hands on training' experience on how to use ozone as an effective agent capable of resolving every oral infection, from caries, to perio, endo, bone, and soft tissue infections. Ozone; one non-toxic agent with no toxic side effects and no possibility of resistivity. Each course understandably sells out far in advance of the date of the course (i.e. register early). This is an outstanding opportunity for licensed Dentists to obtain intensive hands on training on the use of ozone in dentistry, in an intimate gathering that enables one on one instruction. Practitioners are sent home at the end of the course with a complete understanding regarding the Ozone Protocols that are essential for Dental Medicine, and therefore the ability to use ozone immediately in the practice. Click HERE to Read More, or Click HERE to Register Now! Dr. Dennis Harper DC is a renowned physician, speaker, and trainer in Regnerative Medicine using Ozone, Vitamins, and Biological Allograft (stem cells) in innovative applications and protocols that he has developed to treat patients. Along with documented research and an overview of the terminology, you will learn about several different types of "Stem Cells" that are currently on the market, how and why they actually work, as well as the risks and benefits of each. You will learn administration methods, when to use each, and how to implement these techniques into your existing practice. What: "Advanced Ozone, Stem Cells and the Connection to "Live to be 139"
This 2 day seminar at Dr. Harper's clinic in Northern Idaho has to be experienced. There will be an Ozone Presentation for Staff and Patients, the connection to "Live to be 139" and how to implement this in your practice. You will also review the 57 point Ortho-Neuro exam in 4 minutes, extensive training on Biologic Allograft (stem cells), Neurotherapy: Adrenal resets, Lumbar resets, Documentation, Hands-on practice (Ozone ijection sites, Protocols and mixtures, Jumpstart IV's). This an interactive class, customized to the needs and goals of doctors that register. There will also be an overview of our team of HRS Instructors Dr. Brendan Cochran, Dr. Carmen Mora, and Dr. Erik Lundquist. Along with classes they will be offering in 2019 as part of "Live to Be 139". See HarperOzone.com for more information. Need more information on Harper Restoration System Seminars? : Don't Miss This Great Opportunity to Expand your Practice and offer Regenerative Techniques that WorK! You will learn how to perform cutting edge regenerative medicine with Stem Cells, Ozone, and OCM: Ozonated Clot Matrix. You'll provide your patients with leading therapies that are proven to work AND you'll be offering regenerative medical techniques that none of the other clinics in your area can match. Get excited about Stem Cells. There are several different types on the market that can be somewhat confusing. Fortunately Dr. Harper will teach you about all of them. Yes...YOU can use stem cells. These seminars demonstrate how you can successfully integrate stem cell therapy protocols into your practice. Included in the training is hands-on training and instruction so you can use these techniques as soon as you return to your practice. Also included?...patient marketing materials so you know how to get your patients excited about your new regenerative skills, website network presence, and back office management procedures. Dr. Harper offers you the whole package! Hands on training, background information, and marketing and management materials and knowledge! Dennis Harper DC has developed a simple, cost effective alternative to PRP that is proving to be better than PRP. OCM uses amino acids and B Vitamins with Ozone to create a medium where the platelets are held in a cytokine rich and highly ozonated clot matrix. This provides cells with the ideal medium to enhance cellular differentiation. OCM is easier and safer than PRP becuase centrifugation and chemical additives are not necessary. The process produces a fibrous matrix resembling foam that when injected into joints is active for 14 days stimulating stem cells and regenerating cartilage. OCM is easy to perform and is essentially replacing PRP. Watch the video "Ozone Clot Matrix with Regenalyn, Better than PRP".